Store and protect your wine glasses, champagne flutes, cocktail glasses and other stemware in an clean and attractive way. Both an up-sloping entry position and a stop at the back can prevent glass cups from falling out. 2 PCS x 2 rows wine glass rack stemware holder. Display and Protect Your Delicate Crystal Stemware Glasses(wine glasses, champagne flutes, cocktail glasses, sherry glasses, snifters glasses etc.) Conveniently and Tidily. NO RUST: Stainless Steel in Chrome Finish. 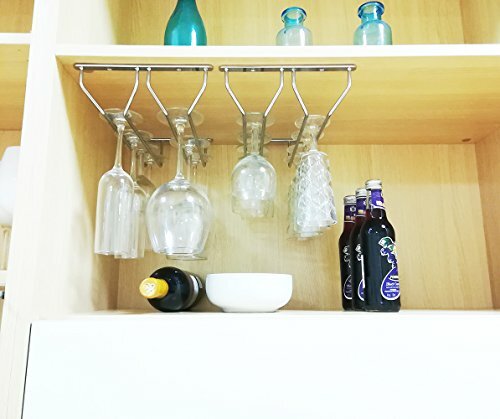 The Wine Glass Holder Makes Storing and Using Wine Glasses So Easy. Durable Construction. Designed for Bar and Home Kitchen, Dining Room etc..
Easy to Mount under Shelves or in/under Cabinets/Cupboards or anywhere you want. Mounting Screws and Anchors Included. If you have any questions about this product by Meiliwang, contact us by completing and submitting the form below. If you are looking for a specif part number, please include it with your message.